… gives you many benefits! 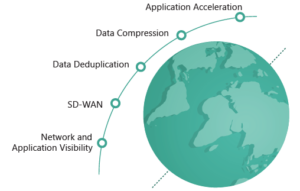 Accelerate On-Premises and SaaS/Web Applications Globally. Speed up your applications globally, even in remote locations to deliver consistently smooth user experience and high productivity. Enable Faster Access and Performance for Cloud Platforms. Experience fast, stable and predictable performance for data, infrastructure, applications and other IT assets hosted in IaaS/PaaS environments. Get Stable and Fast Branch Office Network Connectivity. Benefit from fast performance, consistently low latencies and negligible packet loss when connecting branch offices over the global network. Deploy Branch Office Network Connectivity in less than 48 hours. Deploy branch office network connectivity in only 8 to 48 hours, compared to the weeks or months it takes with MPLS. Reduce Network Management Hassles. Function with a smaller IT team, and avoid deployment, maintenance and upgrade hassles associated with appliances. Network and Application Visibility. Gain an end-to-end, transparent view into the performance of your network and applications using the BRADON customer portal. For information and advice please contact BRADON. We would like to guide you to a higher network level.